The Red Tailed Black Shark adds an element of exoticness to any freshwater aquarium. The fish is exotic and entertaining, being very active. They are easy to keep as they have a calm temperament and aren’t too difficult to please. 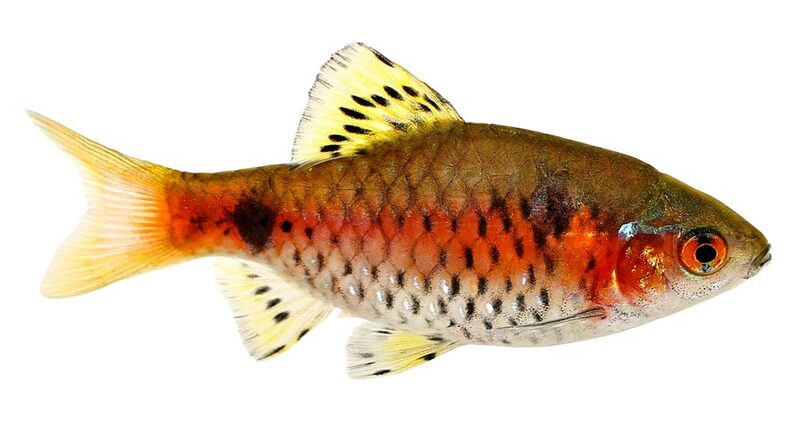 The Red Tailed Black Shark is native to Thailand and has various different names such as Red Tailed Labeo, Fire Tail, and Red Tail Shark Minnow. They are found in freshwater and floodplains in Thailand’s MeNam Chao Playa basin. The fish is known for its exotic look with a fire red tail and a completely black body. Even though it is known as a shark, its face actually is like a carp. It doesn’t actually belong to the family of sharks but rather the Cyprinidae family. It isn’t a fussy eater and can eat almost anything you feed it as it is an omnivore. It does require a lot of room in an aquarium as it is territorial. The fish can grow between 5 to 6 inches and lives for about 6 years. The Red Tailed Black Shark is a timid fish when it is young. You want to provide it with plenty of room to roam and hide when it wants to. However, as they grow they become more aggressive and very territorial. They are known to attack other fish that come into their territory. They won’t bite or attack the fish but will chase it until it is completely exhausted. Keeping their behavior in mind, you want to make sure you keep the fish in a large tank. Tanks that are at least 55 gallons. You want to have places for it to hide and each of the fish needs about 1 meter in tank length. You should also try splitting the tank so their territories aren’t poached too much. The water flow should be fast and keep the environment as natural for them as possible with gravel and pebbles. The name Candy Cane Coral comes from the stripes of the coral’s polyps. You can find them in different colors from brown to green with alternating white stripes. Under the moonlight, the coral glows with a fluorescent which makes it seem outer worldly. In an aquarium at night, you get the same appearance which makes the aquarium look more exotic. You don’t need to do too much to take care of a Candy Cane Coral, it requires high-intensity lighting, food on a regular basis and moderate water flow. They are rather tolerant and can sustain low calcium and salinity which means they can be put in an aquarium for beginners. So if you are thinking of getting the Candy Cane Coral for your aquarium here is all the details you need to know. Care: Level of care is easy, they require moderate light and water flow along with supplement target feedings from time to time. They are wonderful for LPS coral keeping. Origin: Fiji, the Solomon Islands around the Into-Pacific region. Temperament: The Candy Cane Coral is calm and needs room to grow. If you keep them with more aggressive coral they will not grow and survive too long. So be sure to allow them space when you keep them. Food: The coral will grow much faster if feed properly. You want to feed it marine origin foods in tiny pieces during the day or when they are exposed to light. This is when the tentacles would be out and you can push the food towards them. This should give you a good idea about the Candy Cane Coral and how you can keep one at your home. They truly add to the aesthetics of the aquarium and make any room much more exotic especially at night with low lights when the coral glows. The Tiger Barb isn’t the friendliest fish in the sea. It has a temper which makes it not the best companion in an aquarium for other fish. So when you get a Tiger Barb, you want to make sure that you have companions that it will get along with. 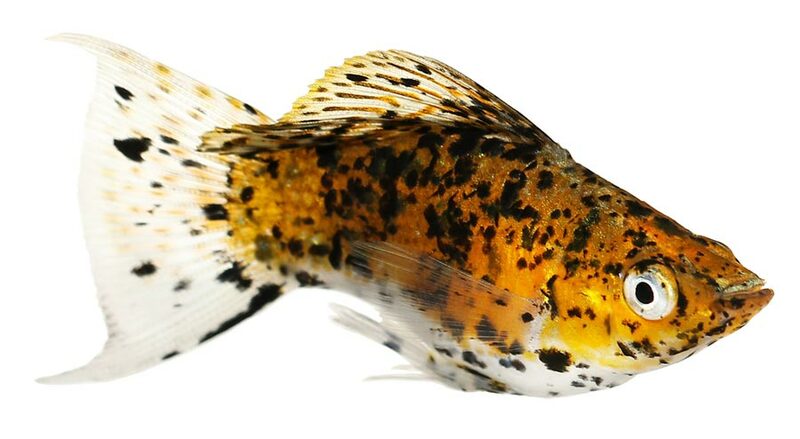 We have 8 tank mates for you to consider that a Tiger Barb gets along with. The Platies are peaceful fish that get along with almost any type of fish. They aren’t too big as they grow to be around 2.5 inches. Their size is actually a reason why they get along with a Tiger Barb. The Tiger Barb will normally not attach a Platies because it is bigger than the Tiger Barb. Their fins are also short so the Tiger Barb has no chance of nipping it. They are inexpensive fish that can survive in the same surrounding and water atmosphere as the Tiger Barb so make great tank mates with them. Mollies are another type of fish that grows to be quite bigger than the Tiger Barb. As the fish can grow to be up to 7 inches. It also has small fins so the Tiger Barb won’t be able to attack it. The Mollies like the Tiger Barb like warm water so can easily stay in the same aquarium. Tiger Barbs tend to get along with other Barbs. So the Black Ruby Barb is one they normally do not mess with. The Black Ruby Barb grows to be 2.5 inches. The fish itself is peaceful and their larger size means the Tiger Barb will not attack them. You can add them to a tank with Tiger Barb without a worry. The Odessa Barb is another Barb fish so the Tiger Barb generally are calm around them. The fact that the Odessa Barb grows to 4 inches also helps it stay clear of the Tiger Barb. The fish itself will not cause any harm to the Tiger Barb as it doesn’t attack fish. 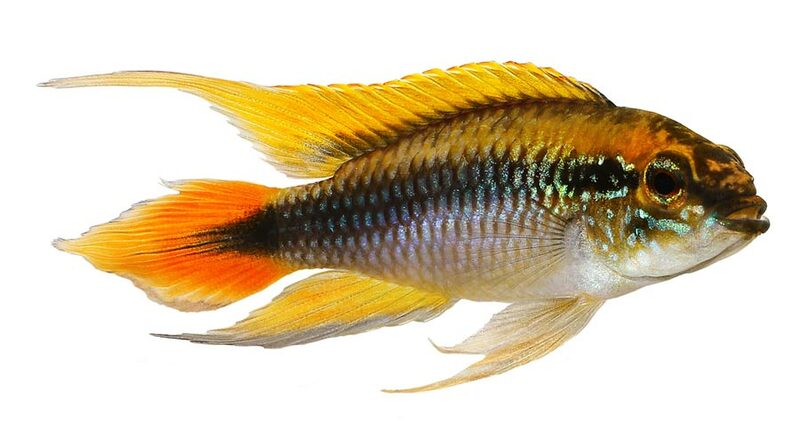 If you like Cichlid and want to keep one with Tiger Barbs then the Agassizi Cichlid is a great option. The fish are acclimated to the same water conditions as the Tiger Barb and can grow to be 3.5 inches. So the Tiger Barb stays clear of them. While the Agassiz Cichlid itself is peaceful, it prefers to be in a group so you want to consider getting a few of them. Another type of Cichlid, the Red Spotted Several is generally a peaceful fish. It may get slightly aggressive when it comes to mating season but overall it is peaceful. It is a much bigger fish than the Tiger Barb, growing to 10 inches so the Tiger Barb will not attack it. It also has short fins. 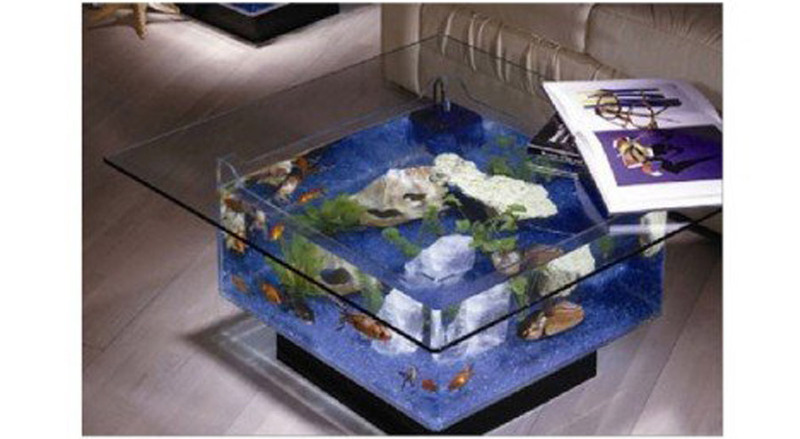 A fish tank coffee table is a wonderful piece of interior decor that drastically changes the aesthetics of the room. It doesn’t only make the room more colorful but also becomes the center of attraction of the room. 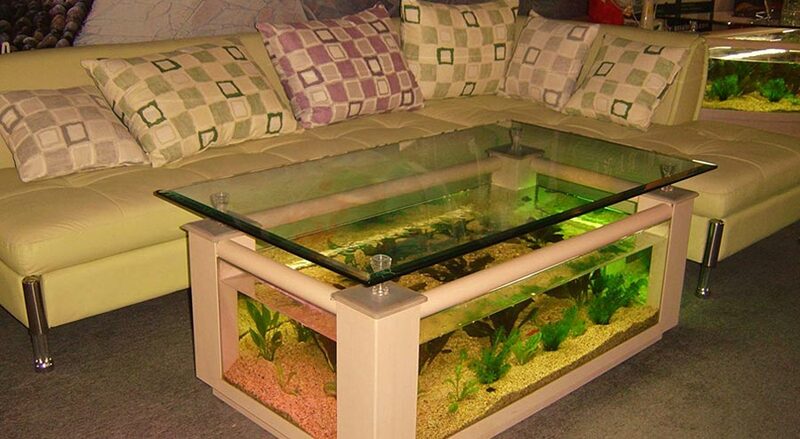 Which is exactly why a lot of homeowners opt for a fish tank coffee table. We have a review for the 4 best fish tank coffee tables you should consider for your home. The Aqua Coffee Table is going to be the center of attraction in your living space. It is a beautiful fish tank that will add elegance to the room. 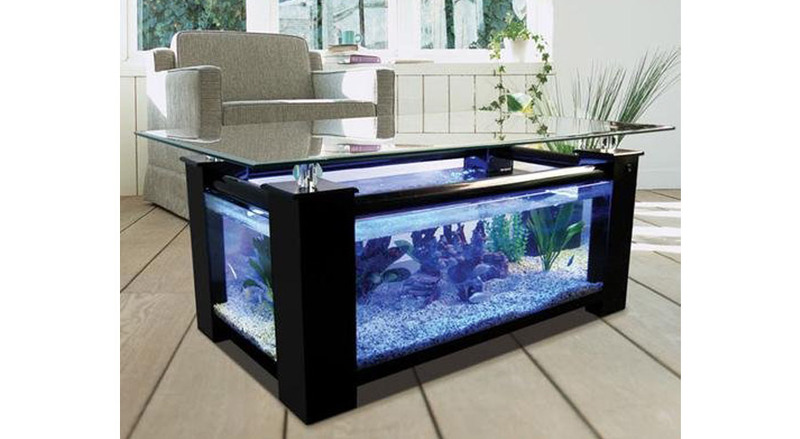 The table comes with a respectable 28-gallon tank and has a glass top so you can view all the fish from above. The tank allows you to view the aquascape as you sit and enjoy a cup of coffee or just lounge around. All the material of the aquarium such as the filtration system and lighting is safely tucked into the bottom of the tank so they don’t obstruct the viewing experience. So if you are looking to improve the decor of your living space then we recommend you give Aqua Coffee Table a try. 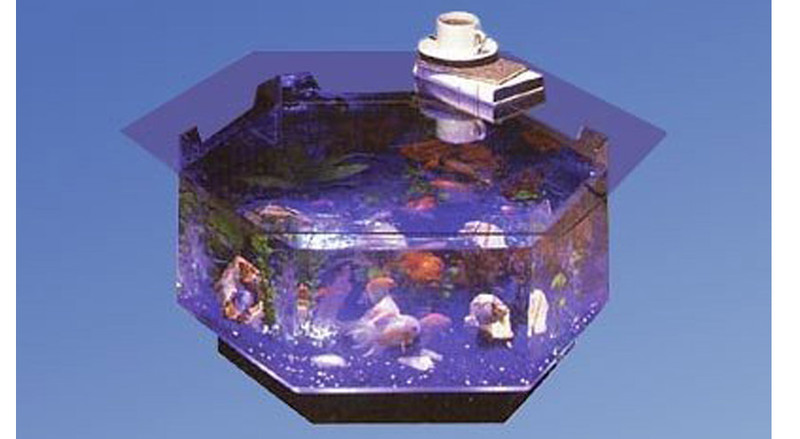 The Long Octagon Aquarium Coffee Table is an octagon shape table, which some may prefer over the ordinary rectangle shape table. The table has a massive tank of 40 gallon which enables you to keep larger fish. With such a tank, you can house more fish, making a proper aquarium-like atmosphere at home. It comes equipped with a strong filtration system that ensures the habitat in the tank is exposed to clean water. The clear glass top allows you and your guest to gaze at the fish from every angle. The AquaVim Rectangle Coffee Table design isn’t like the other two tables above it. It actually doesn’t have a complete glass aquarium, there is a wooden frame around the edges of the aquarium. However, the frame adds a bit of elegance to the overall look of the table. It comes with a 36-gallon aquarium tank which will allow you to keep quite a few tropical fish or smaller fish. The table comes with a proper ecological environment for the fish, with beautiful plants and a proper filtration that ensures the environment is clean. The Midwest Tropical Foundation 25 gallon Coffee Table is a square shape that has a 25-gallon aquarium in the body. This table is a great addition to smaller living spaces and the glass top is as durable as any. The aquarium comes equipped with everything you need from a filtration system to artificial plants so all you need to do is add the fish of your liking and watch them beautify the decor of your living space. 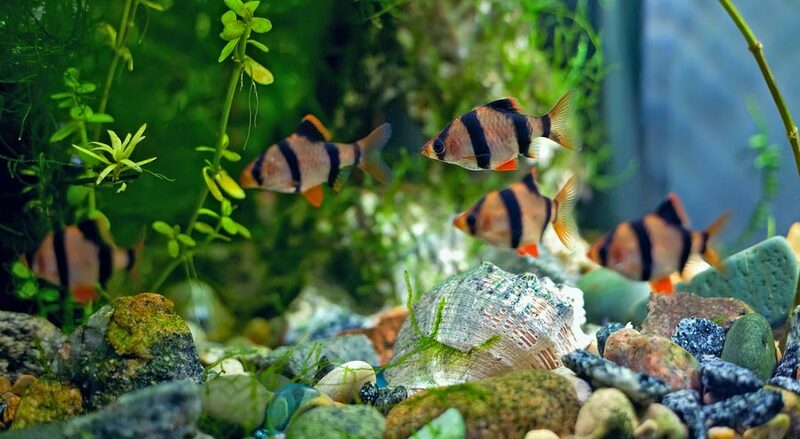 Keeping an aquarium at home is definitely a rewarding experience but it isn’t as easy as most people think. Fish may seem like an easy option for pets since they don’t require as much attention as other animals but maintaining an aquarium isn’t always smooth sailing. Most beginners face a lot of challenges initially because they don’t know the ins and outs of aquarium maintenance. We have important tips that will help you become a successful aquarium owner. If you aren’t familiar with the term “cycle the tank” this refers to ensuring that the tank and water conditions are healthy enough for you to put the fish in it. So when you first get the tank, don’t just fill it with water and put the fish in it. You need to purchase the tank first, cycle the tank making sure it is healthy. The cycling process consists of making sure the tank’s water temperature is right for the type of fish you will put in and there is healthy microorganisms within the water that will breakdown the waste. This will make sure the environment is perfect for the fish once you get them. Water testing kits aren’t too expensive so we recommend you get one. You need to constantly test the water for the levels of nitrates, ammonia, nitrites, and pH. Make sure that levels of nitrates, nitrites, and ammonia are low. If they begin to rise, make sure to bring them back down. You have two options to ensure the water parameters stay low, you can buy products that ensure they remain low or you can change the water in the tank. Changing the water takes a lot more effort and time but is a better option. In fact, we recommend that you change 1/3 of the water in the tank every week. There are numerous different types of fish and you should do proper research about the fish before you bring them home. Each type of fish has its own parameters and temperaments. They require a certain temperature, surrounding, and what not in order to survive in an aquarium. So you want to make sure you provide them with the exact environment that they are used to. So you’ve decided to get a goldfish aquarium but don’t really know much about how to approach it? While goldfish aquarium are a wonderful addition to the home, most people don’t know how to properly set it up. We have everything you need to know in setting up a goldfish aquarium at home. You want to make sure the aquarium tank you get is big enough for the number of goldfish you get. Goldfish produce a lot of waste so generally require a bigger tank. You need to know how many goldfish you get and for every inch of goldfish you want to a minimum of 24 square inch of water. That is quite a lot of space so the bigger the tank the better. Where do I place the tank? The placement of the tank is also important as you want to make sure that the tank gets natural sunlight while also has a power source. While you are at it, you may also want to make sure the water supply isn’t too far either. When finding a spot, don’t put it directly in front of the window as it may result in the tank heating up. Goldfish require a consistent temperature of about 74 degree Fahrenheit. They also need the sunlight so their color doesn’t fade. So you need to find a good spot that provides sunlight for the most part of the day but is not too direct. If you are planning on getting a bigger tank then you want to make sure you have plenty of support under it. Make sure the stand or table under the tank can hold the weight. Even a tank that holds about 10 gallon of water can weigh around 100 pounds so be sure it has support. 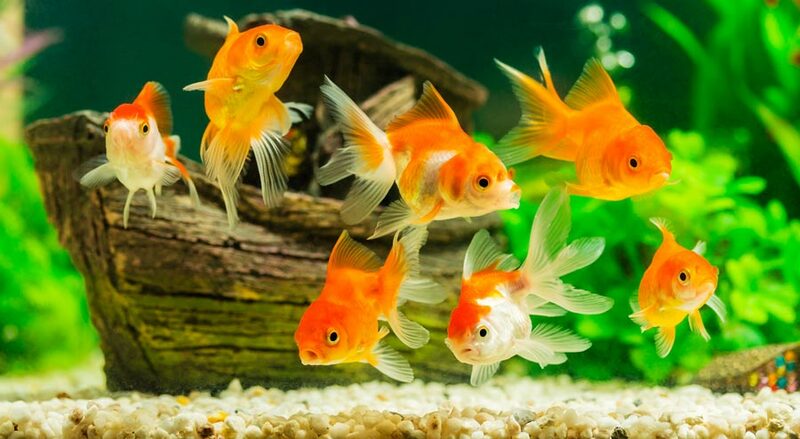 Goldfish produce a lot of waste so you want to make sure you have a proper filtration system in the tank. The flow rate of filtration should be high in terms of amount of filtered water per hour. Based on the amount of water in your tank, you want a system that filters at a rate from 5 to 10 times the overall volume of your tank. How much gravel should I add? If you want to add gravel to the bottom of the aquarium you want to make sure it is fish-safe. For goldfish you don’t want the size of the gravel to be more than 3 mm. You can fill the bottom of the aquarium 3-4 inches up of gravel from the base. Whether you are a fish enthusiast or looking for a way to add a little extra color at home, an aquarium is a great solution. 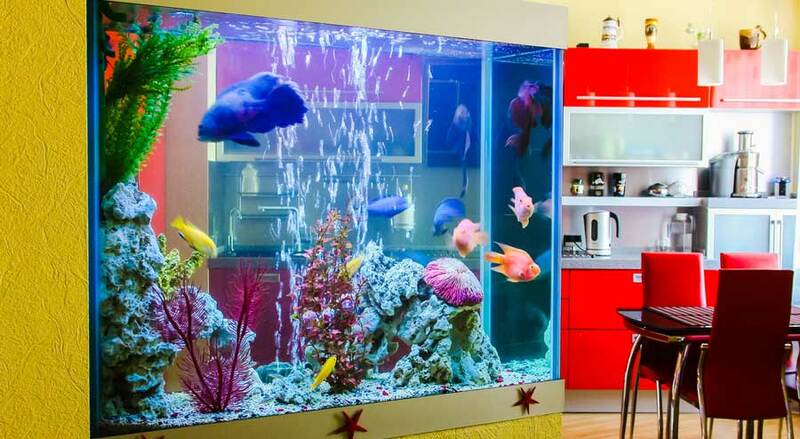 With an aquarium, you can easily keep a pet that is easy to manage in fish while also adding to your home aesthetics. Fish have also been known to help reduce stress and blood pressure so they are actually beneficial for your health. As wonderful as having an aquarium sounds, setting it up isn’t a simple job. 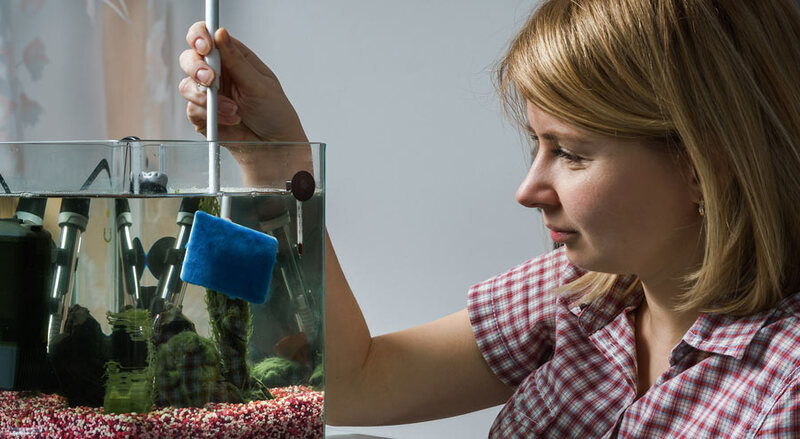 We have a step by step guide for you to help you set up that aquarium you’ve been wanting. You want to start by setting the base, stand of the aquarium first. Once you have placed the stand in the spot you want, you can put the tank on it. Make sure the tank is placed perfectly on top. Tips: When picking a spot for the aquarium in your home, you need to ensure it is not exposed to direct sunlight. You also want to ensure there is at least 5” space from the aquarium to the wall it is “against.” This will provide enough space for the filter and ensure the stand is completely leveled. Once you have placed the tank on the stand, you need to add the gravel in along with any decoration piece you want in the tank that will be on the gravel. Then place a plate on top of the gravel and pour water on the plate, this will ensure that the gravel is not displaced while the tank fills up. Tips: To ensure the gravel is clean when you put it in the tank, you want to rinse it with clean water. If you decided to use tap water which has chlorine, then you should also use a chlorine neutralizer. Make sure you also clean all the decoration objects you place in the aquarium beforehand. You can now install all the equipment that comes along with the aquarium but make sure not to plug it in just yet. You start by hanging the power filter first on the back of the aquarium. Place the thermometer where you can easily read it within the aquarium and then install the heater, not too far from the filter. Once you have everything setup, plug it in and let it run for about 15-20 minutes. Then you can add the fish to the aquarium. You can then add the canopy and light to it also. If you are planning on adding a lot of fish then we recommend you add 5-6 first, for the first 4 weeks. This will allow you to test the nitrite and ammonia in the tank. Allow them to go to zero and then you can add more fish. This is a general setup for a 55-gallon aquarium. You can have a total of 55 inches of fish in this aquarium, this is all the sizes of the fish added. Adding more will overcrowd the tank. Bringing fish home and not sure how to take care of them? Taking care of fish is not as easy as you may think. You need to make sure you take the proper measures so the fish can survive in your aquarium. We have 4 tips that will help you understand the process of bringing fish home and taking care of them so they stay healthy and happy. When you move, you don’t just get up and move in one day to an empty place. You get the new place set up before you make the move. Similarly, you want to make sure that the fish when you bring it home, you bring it to the environment it is used to so it can easily adapt to the shift. This means you ask the expert at the pet store the level of nitrate, pH, and ammonia the fish is used to and test your aquarium to ensure it matches. If it doesn’t chances are the fish will take much longer to acclimate. We all need our personal space, so do fish. Overcrowding an aquarium is a sure way that will result in fish dying for one reason or another. When a fish tank is overcrowded there is a lower level of oxygen in it and excess waste which puts more load on the filtration system. Not only that, but it can even cause fatalities amongst fish especially when you have a mix of different types of fish in the same tank. Water is to fish as air is to human. So you want to make sure that the water they are exposed to is clean just as clean air is important to us for a long and healthy life. 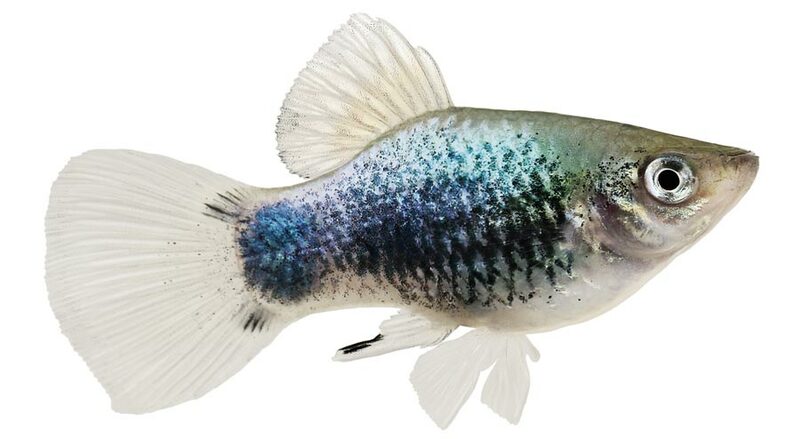 Most people tend to put tap water into the fish tank, while you can do that, it is important you condition the water so it is clean and similar to the water they are used to. To do that all you have to do is de-chlorinate the water and add a biological aquarium supplement which you can purchase at your local pet store. Be sure to condition the water each time you change it. The temperature in the tank should remain as constant as possible. 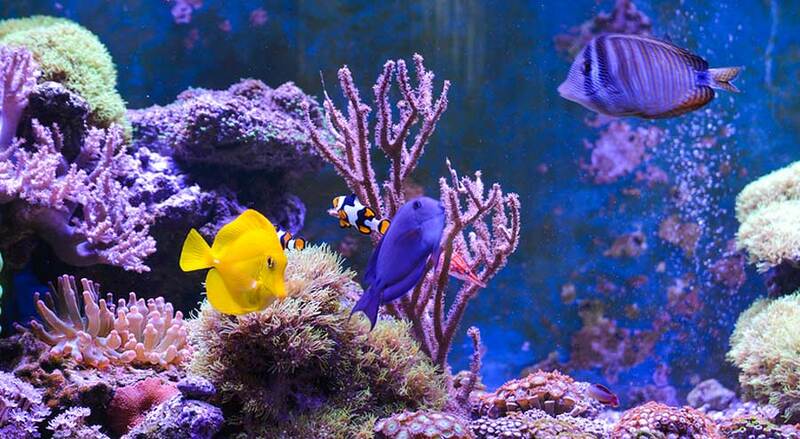 You want to maintain a temperature that falls between 72 degrees and 82 degrees Fahrenheit, for tropical fish. Lower for those that are used to cooler temperatures. In order to make sure the water stays constant, make sure the tank is not placed in contact with the sun which means not next to a window or an area where there is direct sunlight. Also, keep it away from a/c and heater vents around the house. Is a Glass Fish Bowl The Best? Fish can help improve the aesthetics around the house. Not only that, keeping a fish in general doesn’t require the same amount of effort as many other pets. The only time it does is if you have a massive aquarium that you need to clean once a month. That is why most fish owners prefer keeping a smaller quantity of fish in a glass fish bowl. If you are considering bring fish home, then here are some reasons as to why a glass fish bowl would be a good choice for you. Glass fish bowls are cheaper than aquariums, a whole lot cheaper. 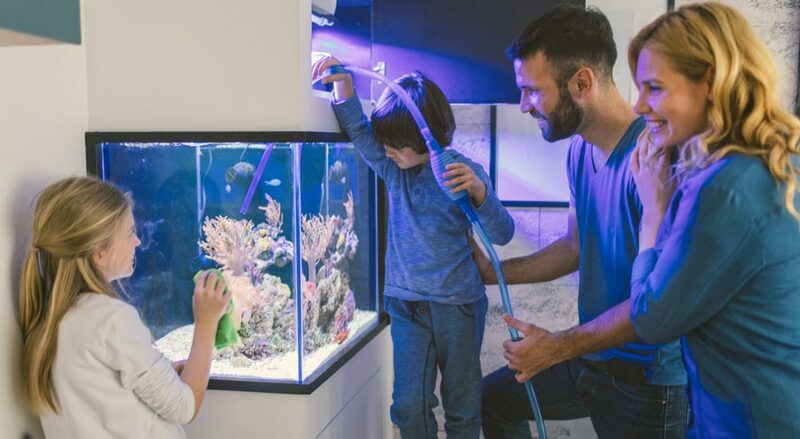 You can get a decent size glass fish bowl under $100 whereas an aquarium tank goes well over that, especially if you are looking for one that works well in regulating and filtering the water on a constant basis. While glass fish bowl doesn’t have filters, they are fairly easy to maintain. They aren’t massive so you can only keep a limited amount of fish in a fish bowl, which ensures you don’t overstock your fish bowl. It is a lot easier to manage in terms of cleaning, you can easily take the fish out, put them in a small bowl of water, clean the bowl and put them back in. The whole process can be done in minutes as opposed to a fish tank which takes a lot longer. Fish in fish bowls are a great starter pet for children as long as they take care of the fish. Since it is light and doesn’t require much as far as maintenance goes, they can easily take care of the fish on their own with minimal supervision from parents once you explain to them how to go about it. With a fish tank, you need to basically dedicate a particular spot in your house to keep it. 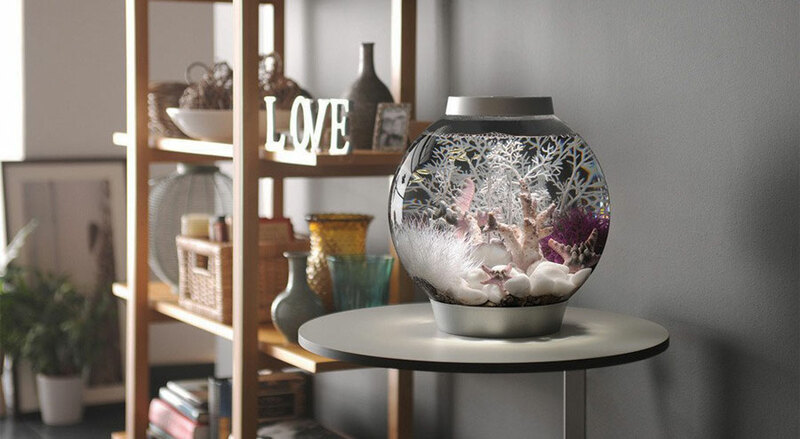 With a fish bowl, you don’t need a lot of space and can easily move it around per your liking. This makes it easier for you to manage and change the setting of the house without having to worry about moving a heavy tank and finding a new place for it. 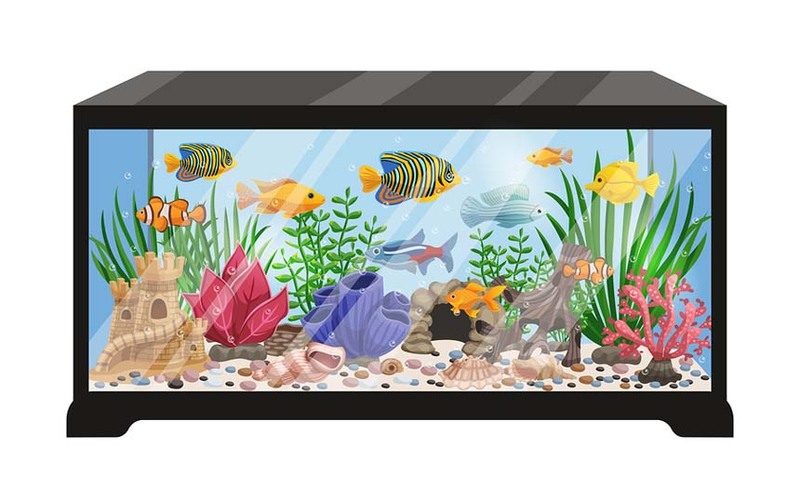 While it is slightly easier to keep a glass fish bowl then it is a fish tank, the choice also heavily depends on the type of fish you plan on getting. Glass fish bowl is generally good for smaller fish that don’t grow to be too big. For bigger fish or if you are looking to have a lot of fish, you should reconsider and get yourself a fish tank. It is important that fish have the proper ecosystem and space to move about and if you restrict them in a small bowl chances are they won’t survive for too long. 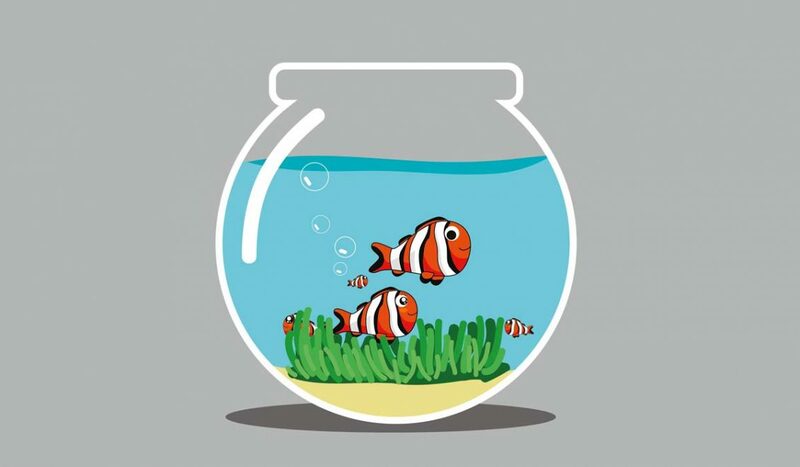 So before you go out and get yourself a fish bowl, make sure you plan so you can make the right decision on whether a glass fish bowl or a tank is better for you. 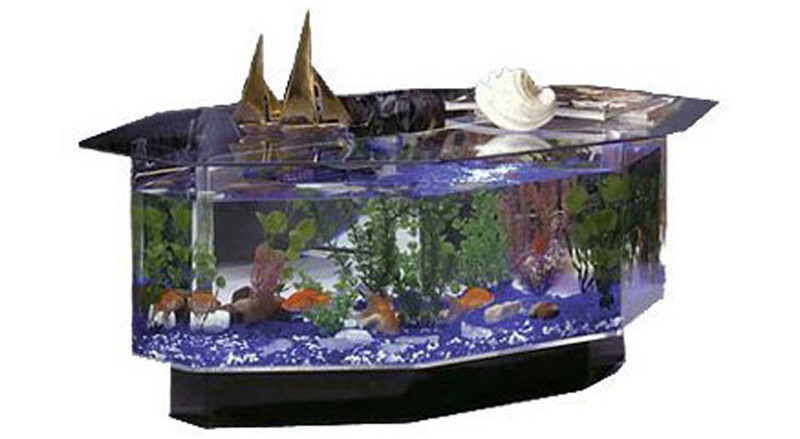 Gone are the days where glass bowls would prevail over another type of fish tanks. Yes, glass bowls are easy to maintain and are a simple way to bring a couple of goldfish home. However, it is no longer the best option in terms of keeping a small aquarium at home. 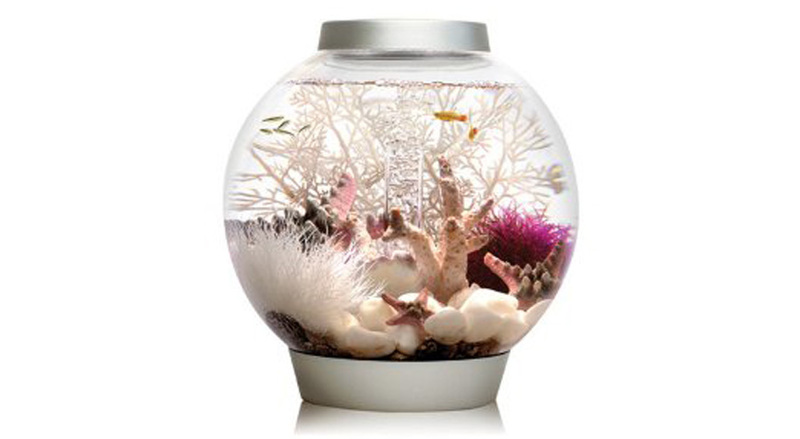 Biorb has designed fish bowls that allow you to keep a small aquarium at home that is far more appealing and just as easy to maintain. Biorb has two main types of aquarium, selecting one depends on how big of an aquarium you are after. We have reviewed all three, to help you decide which one is best for you. When starting off with your first aquarium, it is always better to start small. The Baby Biorb is a great choice as a starter aquarium for those looking to keep a few fish, it can hold upto 4 gallon of water, in their home and getting the hang of having an aquarium at home. One wonderful thing about this aquarium is the fact that it comes with a biological filtration system, something you don’t usually find in the aquarium of this size. The Baby Biorb is easy to maintain also, all you need to do is change the water every two weeks and the filter cartridge every six weeks. It also comes with a lighting system to add a little more style to it. 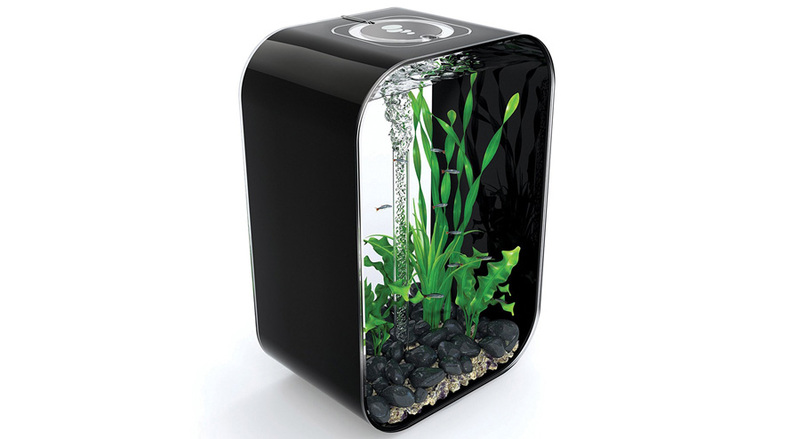 So if you are looking for a small aquarium, the Baby Biorb is a wonderful starter aquarium. The Biorb Life 45 has a tall shape which gives it a bit of elegance and allows for a little more room for both fish and decoration. The aquarium is a cold water aquarium which means you need to keep fish that are accustomed to cold water, 12 gallons worth, like mountain minnows and neon tetras. If you are interested in getting tropical fish then you can purchase an add-on heater that will work in heating the water enough for tropical fish. The Life 45 comes with a biological filtration system and maintaining it is easy. All you need to do is change the filter cartridge every four weeks which changing the water every third week. Overall, if you are looking to add a little bit of life and elegance in your living room then the Biorb Life 45 is a wonderful option.